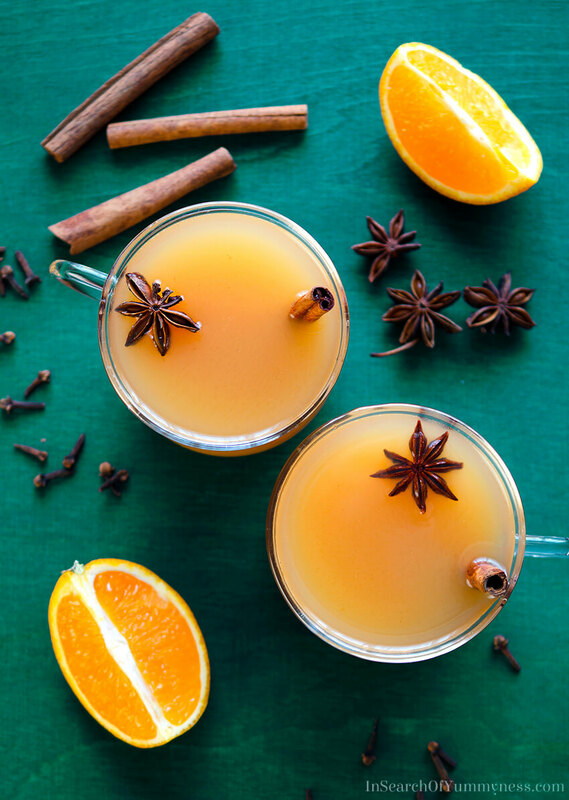 This spiced apple cider recipe is a twist on a classic mulled cider. 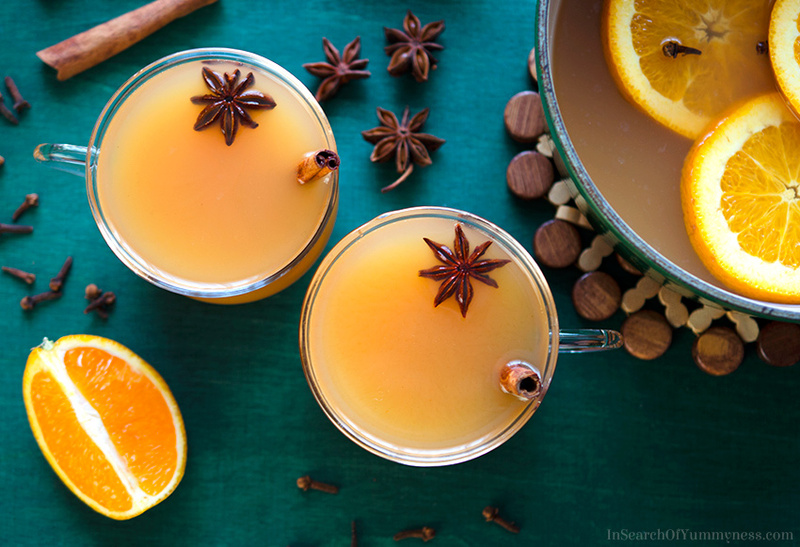 I’ve added star anise and orange slices to this comforting fall drink. Have you ever noticed that certain smells can bring back specific memories? The peppery, anise-like smell of torn fresh basil reminds me of my grandmother. She had told me how much she loved that smell when I was a child. The sweet and spicy perfume of crushed cardamom pods and cloves is a comforting scent that reminds me of home. They are spices that I grew up with. And nothing can bring back memories of making crafts with my mom like the scent of a hot glue gun warming up. Hot glue was the scent of my childhood. But the smell of hot glue can’t compete with the delicious scent of hot spiced apple cider simmering away on the stove. When I was little, my mother would host a Christmas open house party every year. This was an opportunity for her to socialize with friends, family and coworkers in a relaxed, informal, way. We would always have lots of food (my mother’s trademark for parties), lots of crafts for sale (handmade ornaments and doll clothes, usually), and of course, spiced apple cider. The smell of apple, orange and spices makes me feel happy. It brings back feelings of warmth, comfort, and even joy (an emotion that I’ve rarely felt in my adult years). Not bad for a drink that takes very little time and effort to put together. Want to start a holiday tradition of your own? Throw together a batch of spiced apple cider, and break out the board games! Our family recipe includes Star Anise – a spice that is sometimes used when mulling cider, but it’s not as common as cinnamon and cloves. As the name implies, star anise does have a anise-like flavour. Don’t let that put you off, though! It’s not the same kind of liquorice flavour that you’d find in black jelly beans (which I can’t stand!). It’s a sweeter, more fennel-like flavour, and we use so few that you can’t really taste it on its own. The stare anise just adds a bit of complexity to this otherwise simple spiced apple cider recipe. You can feel free to adjust the amount of spices in this recipe. If you want the drink to be spicier, you can add a few more cloves and more cinnamon sticks. You could also just add orange peel instead of slices to the pot. Most of the flavour comes out of the peel anyhow – I just like the sweetness from the orange pulp so I throw the whole thing in there. As for the apple cider, it’s important to note that the word “cider” can refer to two very different beverages. In most parts of the world, cider refers to an alcoholic beverage (sometimes called hard cider). This is not what you want to use in this recipe! The other kind of cider (sometimes called sweet cider or soft cider) is popular in Canada and the United States, and it’s basically unfiltered, unsweetened apple juice. Kind of like those natural apple juices that are cloudy in appearance (instead of being clear). This is what you want to use for this spiced apple cider recipe. In fact, mulled cider is just sweet cider heated with spices and citrus. In Ontario, you can find Martin’s apple cider or Wellesly’s apple cider in groceries and farm stands. Check your grocery and local farm stands in your area to see what options are available to you. Or you can order this sweet apple cider online (but I haven’t tried it myself). I used to recommend wrapping the spices in a piece of cheesecloth before adding them to the pot, because it makes them easier to remove. But honestly, it’s just an extra unnecessary step that makes this recipe more complicated than it needs to be. If the whole spices don’t bother you, just throw them in and be careful not to ladle them into the mugs at the end. You don’t want anyone to accidentally swallow a whole clove! Alternatively, you can strain the mixture before serving. You could strain it through a sieve and store it in a thermal carafe to keep warm, or just pour the mixture through a sieve into each mug. The longer this spiced apple cider simmers, the better it tastes. I usually simmer mine for about 20 minutes, then take the pot off the stove and leave it covered for a while. If you want to simmer yours longer (up to an hour), just make sure your heat is very low so the cider doesn’t evaporate too much. You could also make this in a slow cooker, on the lowest setting. If you find that your cider has developed a scum or foam at the top, you can just skim that off before serving. I hope you try making this spiced apple cider recipe! It’s one of my family’s favourite fall drinks, and I promise your house will smell SO GOOD!! 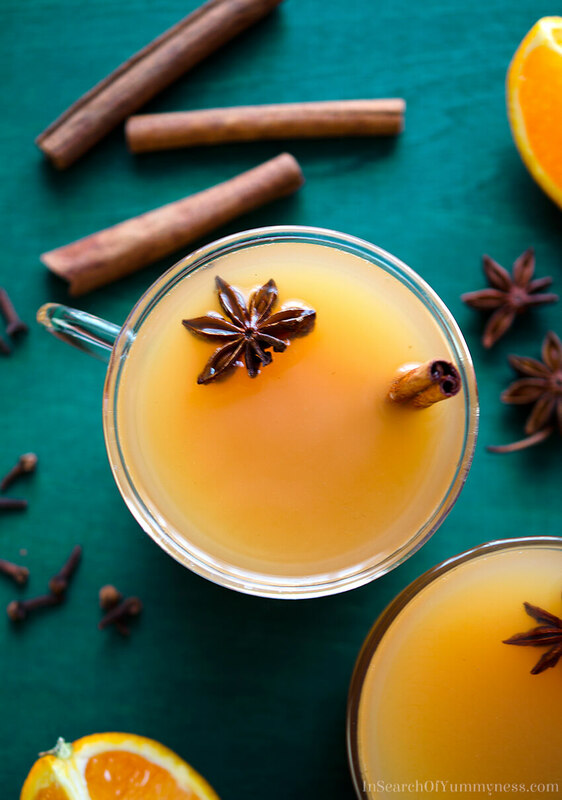 This warm drink combines store-bought apple cider with oranges and warm fall spices, creating a perfect drink for cold weather. Combine apple cider, spices and orange slices into a large pot. Place over medium heat. Bring mixture to a simmer, then reduce heat to medium-low. Cook the cider for another 15-20 minutes, then remover from heat. 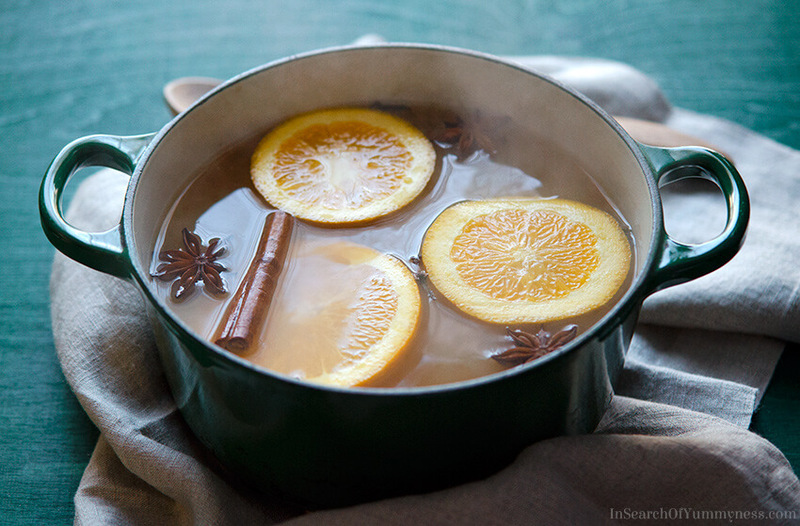 Ladle hot spiced cider into mugs and serve with a cinnamon stick and/or star anise pod for garnish. If you prefer a sweeter apple cider, you can add a little bit of white granulated sugar to the simmered mixture. If desired, strain the simmered cider before serving. To make hard apple cider, add a splash of bourbon, brandy or whiskey after you take the cider off of the heat. Be sure to refrigerate leftover portions promptly, and consume within 2 days of making. I will be compensated if you make a purchase after clicking on my links, at no additional cost to you. Thanks Cindy! I think it’s a nice alternative to some of the really sugary winter drinks. I’m bookmarking this for the first cool night we get here after summer 🙂 I love hot, spiced drinks and this one has just made it to the top of my to-do list 😀 Thanks for sharing at Smoothie Of The Week! This sounds amazing! The aroma must be just fabulous! It is so true that just a smell can take us back to another time, it is pretty cool how smells can bring back memories instantly. This sounds so delicious and the aroma must be incredible. I think this is s evils I must make this winter. Pinned! I need to try this this year! I love cider — I used to actually make it in a crock pot but I totally misplaced the recipe. Love the styling here too, Shareba. Beautiful! You can make this version in a crock pot too! Just keep it on the lowest setting, and check it periodically to make sure it’s not getting too strongly spiced. Thanks so much Justine!